HMH Books for Young Readers, 9780544598171, 160pp. Max and his dad love their weekends together. Weekends mean pancakes, pizza, spy games, dog-walking, school projects, and surprising neighbors! 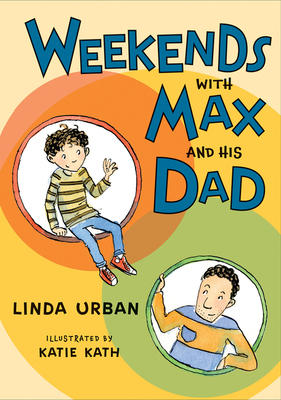 Every weekend presents a small adventure as Max gets to know his dad’s new neighborhood—and learns some new ways of thinking about home. Acclaimed author Linda Urban deftly portrays a third-grader’s inner world during a time of transition in this sweet and funny illustrated story that bridges the early reader and middle grade novel. Katie Kath is the illustrator of many middle-grade novels and several picture books. She lives in North Carolina. Visit her online at ktkath.com. * "Urban’s subtle and perceptive take on divorce will resonate with children facing similar predicaments as she blends Max’s worries and “someone-sitting-on-his-chest” feelings with a vivid imagination and good intentions that take father and son on some very entertaining adventures—with future ones planned." * "Urban excels at credibly presenting this situation from Max’s third-grade point of view... Urban’s writing is both crisply specific (a basset hound “sniffed as she walked through puddles, dragging her ears like flat-bottomed boats”) and simple enough to be accessible." "Urban’s touch is light throughout, and with likable characters... and a story just right for budding chapter-book readers, she’s off to a good start." "The cast of characters grows throughout, but at the heart of the story is Max’s warm, easygoing relationship with his father."